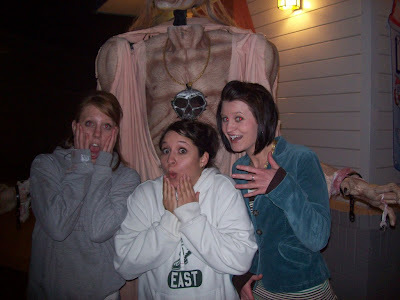 ok so this pic is from 2007 when me and some friends from dental assisting school went to Lagoon theme park in salt lake city, ut for the halloween frightmares nights during october. it was super fun and cold and tons of spooky-tastic-ness. all the great rides are open plus there's mazes and super scary haunted houses and trick or treating for the kiddos and hypnotism shows and dance troupes and lots of other stuff. this is us getting our picture taken with a giant werewolf guy, but the dummy holding the camera cut off his head haha. i'm the hot one in the middle btw ;) haha! it was a lot of fun.